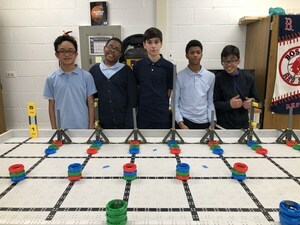 This year, all 8th Grade Hillside students are being offered a Robotics class. Students participate in a project-based curriculum that teaches the design process in an engaging, hands-on manner to help challenge, motivate, and inspire students. By moving students through an actual engineering project, students quickly understand the relevance of what they are learning. In Robotics class, students walk through the design and build a mobile robot to play a sport-like game. During this process they will learn key STEM principles, and robotics concepts. At the culmination of the class, students will compete in a head-to-head Robotics Competition against their peers in the classroom. Eighth grade students in the Semester 1 Robotics class, had the opportunity to qualify for the VEX IQ Challenge by participating in the Ringmaster game. Students formed groups of 3-4 people, designed and built their own custom robots having in mind that it needed to perform specific tasks. Each team had four minutes to score as many points in the Ringmaster game. This game involved navigating their Robot to move and carry colored-coded rings to different locations on a pre-determined course. The team with the highest point total would represent Hillside Elementary School in the Illinois VEX IQ State Championship. We would like to congratulate the following students that will be representing Hillside School at the March 10th Vex IQ State Competition in Bolingbrook.